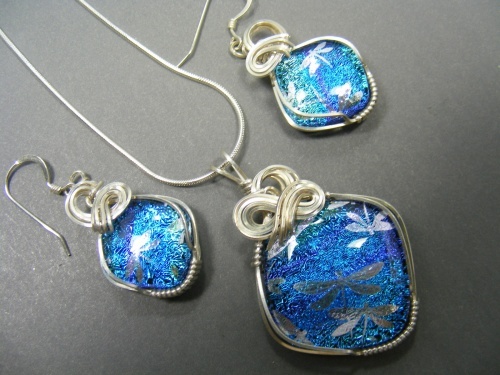 This beautiful set of handmade dichroic glass has playful little dragonflies buzzing around the piece to make it fun and unique. Colors of blue and purple in the background just add to the beauty of this piece. Striking with its sterling silver sculpting the pendant measures 1 3/4" by 1" and comes with the matching earrings that hang about 1 1/4". Pendant comes with a sterling silver snake chain.